Home › Investing › Can I Retire Yet? “Can I retire yet?” is one of the most popular questions that financial advisors receive from clients. And while the answer isn’t always clear cut, you can make some educated guesses based on the size of your nest-egg, social security income, tax bracket, and living expenses. One of the most important factors needed to gauge whether you can afford to retire is your cost of living. If you live like a king and have daily expenditures to match, you will need a treasure chest of savings to keep your standard of living similar during retirement years. On the other hand, if you live comfortably or below your means, it may be possible to hang up the work boots and hit the beach with less savings. But before you buy the sunscreen and beach umbrella, let’s see what the most important factors are that you need to consider. What If I Can’t Retire Yet? You don’t need a retirement calculator to get a ballpark estimate of whether you can afford to retire now. But you will need to be able to closely approximate your daily spending habits to figure out how much money goes out the door each year. Rather than sitting down on a Sunday afternoon with a pen and pencil, check out Personal Capital, LearnVest or Mint, which have excellent budgeting tools that can quickly, automatically, and freely identify how much you spend and where your money is allocated. Once you have identified how much you spend each year in total, you will have a better idea of how much income you need to earn to be able to retire. One factor you should not underestimate is how much extra time you will have on your hands when you decide to close the door behind you on your professional career. With more time on your hands, you may be more likely to spend more and so you should budget accordingly. When you look over your shoulder at your past career, most of your waking hours were probably spent earning income but, when you retire, most of your time may be allocated to enjoying the fruits of your labors, which cost money. Once you have a good handle on how much you spend each year, you can make a better estimate of whether you can retire early. 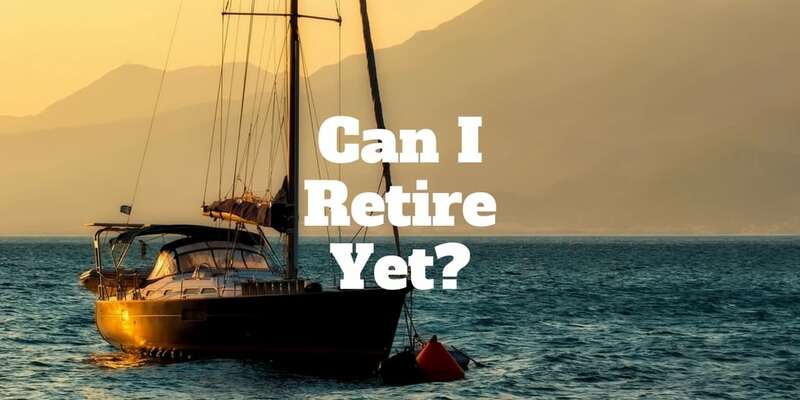 The simple way to answer the question “when can I retire?” is to start by calculating your estimated annual income streams after quitting your job. Start by jotting down how much you have in savings and investments. Let’s say your combined nest-egg is $800,000. As a retiree, you won’t be rolling the dice in Vegas or even the stock market. As much fun as it was to bet the farm on Facebook, Alphabet, or Amazon in your younger years, so too is it generally regarded as irresponsible to be heavily invested in equities during retirement years. At many brokerage firms like TD Ameritrade and Schwab, you can buy government bonds, municipal bonds, and corporate bonds for income. Well renowned companies like Apple, Comcast, Disney, and others pay an annual yield when you purchase corporate bonds. It is not uncommon to find annual yields in the 4 → 5% range on good quality A-rated corporate debt. While interest rates remained low for many years following the 2008-9 stock market crash, Fed rate hikes inevitably occur from one decade to the next, which is a good thing when you are retiring. You want to earn higher yields from your savings. And if we assume that you could earn about 5% annually on average on your nest-egg of $800,000 that would translate to $40,000 per year in gross income. If you discover that this $40,000 per year is insufficient to cover your living expenses calculated earlier, fear not because another income stream may be able to help pay the bills. You may be wondering after calculating your costs and income from savings “can I retire now?” and feeling a little a disappointed if your income falls short of covering your costs. But don’t fret yet because you may have other income streams that you can tap. The most obvious is social security income. If you are aged 62, you can start drawing on social security. However, keep in mind that you will not be able to draw the maximum amount of social security at this age, and you will be locked into the lower amount if you choose it. If you can hang on until age 70 before taking social security, you will receive the maximum benefit. But the calculation is a little tricky to know whether you should elect to receive social security early. For example, if you could receive $2,000 per month from age 62 or $2,800 per month by waiting 5 years, which is a better choice? For five years, you would receive $24,000 per year, which amounts to $120,000. If you waited 5 years to receive the extra $800 per month, it turns out that to get to breakeven on that $120,000, you will be waiting an extra 12.5 years from the time you start receiving the higher amount (because you would receive an extra $9,600 per year). You should factor in that if you start drawing the higher amount at age 67, then it won’t be until you are almost age 80 that you will reach breakeven in terms of the total income received from social security. If you believe that you will live beyond age 80, and you can financially afford to wait in order to receive the higher social security amount, it is generally wise. However, if you have a family history of ill-health, you may elect to choose the lower amount sooner. For now, let’s assume you take the $2,000 per month, so you end up with an extra $24,000 per year from social security. When you combine the $40,000 from your nest-egg earnings with the $24,000 from social security, you end up with $64,000 in annual income. If the combined income from social security and earnings on savings and investments doesn’t quite get you over the line in terms of covering your annual costs, an x-factor that may help you retire could stem from an inheritance. But you don’t want to rely on an inheritance to get you over the hump to retirement. Besides, you should explore other avenues first. For example, your spouse may be eligible for social security benefits too, provided he or she has reached the eligible age of 62. If you both receive $24,000 in income per year from social security for a combined total of $48,000 and add that to the $40,000 earned from savings and investments, you would enjoy a gross income of $88,000 per year without eating into your nest-egg. Another factor that may be in your favor – which often flies under the radar in calculating when you can retire – is that your tax bill may be lower during your retirement years. It is common for most people during retirement years to earn less income per year than when working full-time and so the amount you pay Uncle Sam will be lower. What you care about is not so much your gross income as much as it is your net income or how much you take home after paying taxes. You may even find that taking home less money overall during retirement years compared to when you were working full-time does not not significantly affect how much money you receive each month thanks to a lower tax rate. If you do the math and discover that you can’t quite get over the hump in annual income from investments, savings, social security, and from a lower tax bill to offset your expenditures, then you have a few options. The first step may be to lower your cost of living. If you find yourself visiting the Starbucks each day and add up your total spending on entertainment and fun, you might be surprised at just how much could be squirreled away by eliminating some of those day-to-day costs. Another possibility is to move from full-time to part-time work, which would allow you to draw less on your savings until you have accumulated enough money in your retirement accounts. However, if you find that you are still a long way from being able to afford retirement, you may need to simply set a timeline goal to keep your sleeves rolled up and your head down at work for another few years until you can comfortably afford to give up the W-2 income once and for all. Visit Personal Capital or Mint to get started calculating your spending. Once you have a good handle on your cost of living, you can figure out how much income you can earn from your assets. The Personal Capital mobile app can connect all your bank and investment accounts, so it is easy to get a holistic view of your full financial situation. With a clear idea of your spending, savings and investments, you can make more accurate income projections based on conservative income estimates. For a complete financial picture that factors in your revised tax rate, consider speaking with a financial advisor or tax attorney, who can drill down into your budget and gauge precisely how much money you will take home after paying Uncle Sam and how much income you will need to pay for your expenses during your retirement years. Have you calculated whether you can retire yet? Did you consider other income streams or expenditures? Share your thoughts with us in the comments section below. >> What Is A Living Trust?